The B Hive’s Hotel Feasibility Study looks at the viability of building or refurbishing a hotel or an apartment building. We focus on identifying RevPAR performance, operating income and the structure and terms of agreements; assessing market and operational risks; and highlighting opportunities based on hotel brand, location and competitor performance, with the aim of answering one simple question: Will the investment for refurbishing or building this hotel deliver the expected financial returns? The B Hive adopts a strategic approach to identifying risks and forecasting performance. We assess the financial, strategic, operational and compliance risks to help identify the overall level of risk for the investment. We also consider any gaps, constraints and equally the economic opportunity for the investment, as it is critical that any investment generates financial returns in operations, RevPAR and bottom line results. We provide guidance on budget considerations that can be easily overlooked, from pre-opening budgets, operational cost considerations, fixture and fittings and seasonal impacts. And importantly, we analyse market segments and use STR data to understand the local competitive set and market demand growth, while also allowing time for the hotel to gain momentum and for the initial investment to open. The B Hive has a complete understanding of the hospitality landscape, stakeholders, players and networks as well as unmatched cross-vertical tourism experience in all the relevant areas including Inbound and Domestic Tourism, Transport, Wholesalers, ITO/Ground Handlers, Tour Operations, Hospitality and Sightseeing Tours. 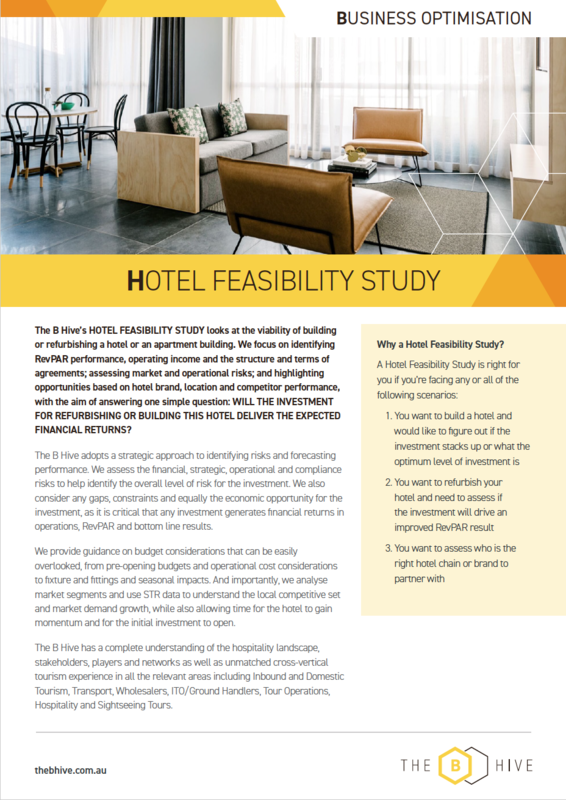 Why a Hotel Feasibility Study? You want to build a hotel and would like to figure out if the investment stacks up or what the optimum level of investment is. You want to refurbish your hotel and need to assess if the investment will drive an improved RevPAR result. You want to assess who is the right hotel chain or brand to partner with. What are the main components of a Hotel Feasibility Study? What’s covered in a Hotel Feasibility Study? STR Competitive Set and other Desktop Research. At conclusion, clients will receive a complete Feasibility Report including clear recommendations. The time line is approximately 4 weeks in duration.